This book was provided to me by the author! Long before Houdini and Conan Doyle feuded over spiritualism, a journalist by the name of Vera Van Slyke attended and upended a séance led by one Lida Prasilova. The results of this fortuitous meeting would be the formation of a lifelong friendship centered upon the exploration and explanation of when ghosts are not real, but also when they are! Vera and Lida’s many adventures are documented here, in this wonderful collection of stories that will bring about as many smiles as hairs standing upon the back of one’s neck. For a good while now, I’ve been slowly expanding my knowledge of spiritualism, focusing especially between 1850-ish to 1930-ish. Since I might write about a fraudulent medium debunker in the future, I’ve been reading both fiction and non-fiction and enjoying both. I don’t quite remember now whether I stumbled on Tim Prasil’s Vera Van Slyke stories while internet searching or through Nina’s Multo(Ghost) blog, but whatever the case, I’m glad I did. Vera Van Slyke is a journalist and a debunker of fraudulent spirit mediums, but with an open mind about the possible reality of spirits. In fact, she has a theory connecting guilt and ghosts that is continually tested throughout Help for the Haunted. Lida Prasilova is a former medium, one that Vera debunked in fact. She a smart young woman and, after going straight, is employed by Vera as an assistant. The first couple stories set up the premise behind Vera’s theory and lead us on investigations that could, while fun, become repetitive. But gradually, the stories widen in scope and become as much about the characters of Vera and Lida as the ghostbusting. I had previously read the first five stories as stand-alones, but I reread them as part of Help for the Haunted. I wanted to see them as a continual narrative. As a complete book, they work. It’s hard for me to talk about this investigative duo and not mention Holmes and Watson. Vera and Lida are NOT Holmes and Watson. That’s perfectly okay; we have enough H&W. Vera is intelligent, but also absent minded (exceptionally terrible with names) and maybe a tad oblivious when it comes to certain things. To me, she feels more like a field scientist, out testing her theory in the wild, where we mostly see Holmes relying on brute knowledge to get him through. Plus, she has an appreciation for beer and lunch. If I were given the opportunity to hang out with Sherlock Holmes or Vera Van Slyke, I’d choose Vera. Never let the shadows of ghost hunting darken a radiant lunch! Lida, our narrator, is not a nearly invisible teller of tales like Watson. Before becoming Vera’s assistant and friend, Lida moves to Chicago on her own, to make her own way. Vera eventually moves to Chicago too after the two are involved in a couple successful investigations. It’s also refreshing to see two female characters who are really friends. They tease each other, but when the chips down they’re supportive of each other, even when it’s not in their best interests. I don’t like to get on fiction’s case for what it does and doesn’t have, but I’ve said it before and I’ll say it again: it’s nice to see two women *doing things* in fiction. Acquired: Compliments of the author, Tim Prasil. 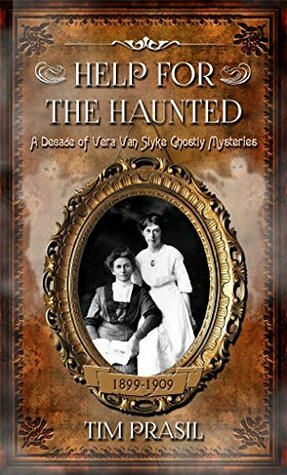 There’s a monthly “haunting” available at the Vera Van Slyke site and lots of great posts on historical occult detectives at Tim’s blog. * SeaWorld, you’re so screwed. I think I would like this. I’m fascinated by this subject as well.